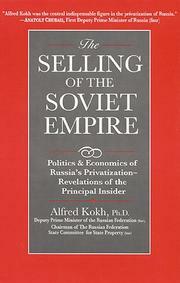 None of the reforms undertaken by the early Yeltsin government may have been more significant than the decision to give the whole Russian population shares in as many formerly state-owned enterprises as possible, and Kokh, as deputy premier in charge of the process until 1997, was closer to that privatization than anyone. The sheer magnitude of the problem was daunting: a huge and dysfunctional economy, hostile vested interests in the Duma, and a population largely ignorant of the workings of a free market stood in the way of privatization. The plan was to give one voucher, worth 10,000 rubles (then about $100), to every one of Russia’s 150 million people; these could then be bought, sold, or exchanged for shares in Russian enterprises. From 1992 to 1994, the government privatized more than 240,000 enterprises in this manner. By the middle of 1994, over 40 million Russian citizens had become share owners; by 1996, 70 percent of all enterprises were privatized—a larger proportion, Kokh says, than in Great Britain. Privatization may have helped preserve democratic government when inflation reached 2,000 percent, when a hostile Duma tried to discredit privatization, and even when the government faltered. But organizing it was a thankless job. The authorities were accused of corruption, of selling too cheaply, and of neglecting national security. When Kokh visited one of the trouble spots, Krasnoyarsk, he was accompanied by guards packing “mini-Kalashnikov machine guns, pistols, and God only [knows] what else.” The hostility surrounding the last phase of the process, when the prime companies were auctioned and real estate was privatized, was even more intense, and eventually Kokh decided that he had had enough, and resigned. Kokh’s account of the process is largely technical, but it’s a valuable account of the work of a small group of courageous technocrats who may have saved a country.